Westair Aviation (Namibia) Embraer ERJ-145 P3Dv4 for the AI Malcontent Embraer ERJ-145 base model. These are P3Dv4/FSX textures only. The AI Malcontent Embraer ERJ-145 base model is required. It can be found at avsim. Search for aim_erj145.zip. To use the model in P3Dv4 you will need to convert it with ModelConverterX following the tutorials given at the Alpha India Group Forums or using AIG AI Manager One Click Installer. I’ve included lightmaps for FSX/FS9 and tga files to convert to whatever format you wish. Trans States Airlines opf American Eagle – House Colours Embraer ERJ-145 P3Dv4 for the AI Malcontent Embraer ERJ-145 base model. 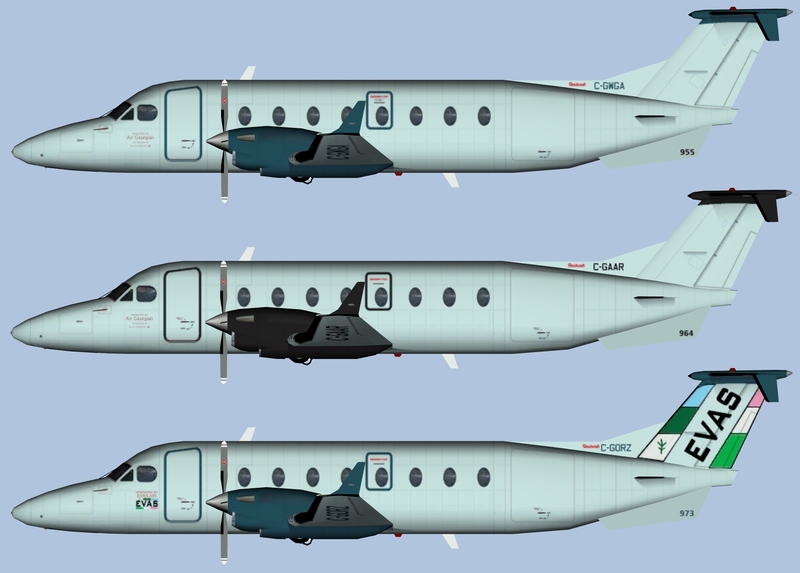 Eastern Airways ATR72-600 P3Dv4 Fleet for the OSP ATR72-500 base model. These are P3Dv4/FSX textures only. Oskari Syynimaa’s ATR72-500 base model is required. It can be found at www.avsim.com. Search for osp_atr_72_500_base.zip. To use the model in P3Dv4 you will need to download the converted model from https://www.alpha-india.net/aigfiles/files/Converted P3D v4 models and replace the FS9 base model. I’ve included lightmaps for FSX/FS9 and tga files to convert to whatever format you wish. 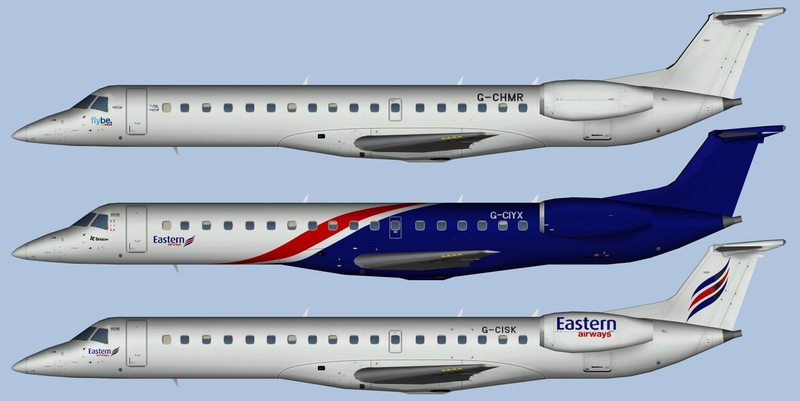 Bristow Helicopters Nigeria Embraer ERJ-135 P3Dv4 Fleet for the AI Malcontent Embraer ERJ-135 base model. These are P3Dv4/FSX textures only. The AI Malcontent Embraer ERJ-135 base model is required. It can be found at avsim. Search for aim_erj135.zip. To use the model in P3Dv4 you will need to convert it with ModelConverterX following the tutorials given at the Alpha India Group Forums. I’ve included lightmaps for FSX/FS9 and tga files to convert to whatever format you wish. 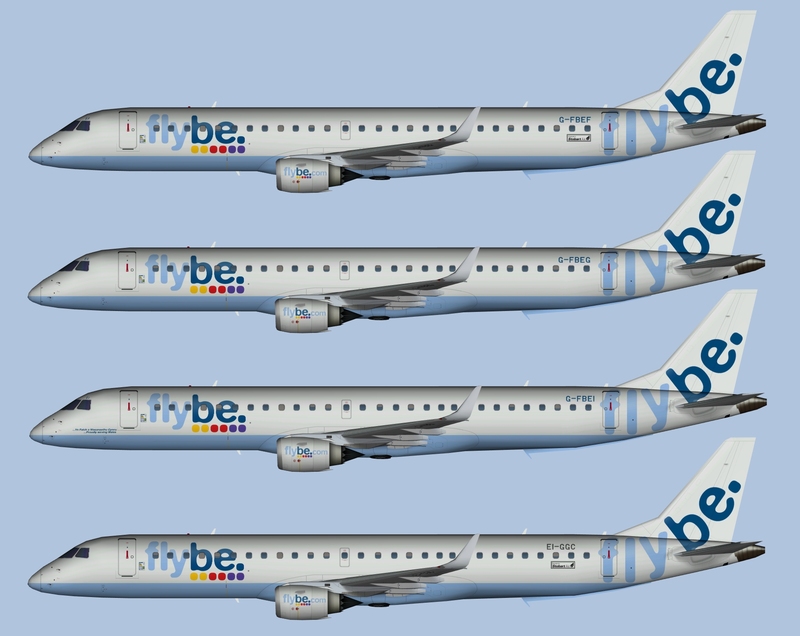 Flybe Embraer E195 P3Dv4 Old Livery Representative Fleet Update for the AI Aardvark Embraer E195 base model. These are P3Dv4/FSX textures only. The AI Aardvark Embraer E195 base model is required. It can be found at avsim. Search for aiemb195.zip. To use the model in P3Dv4 you will need to download the converted model from Avsim (aia_emb195_act_p3dv4_v2.zip)and replace the FS9 base model. I’ve included lightmaps for FSX/FS9 and tga files to convert to whatever format you wish. 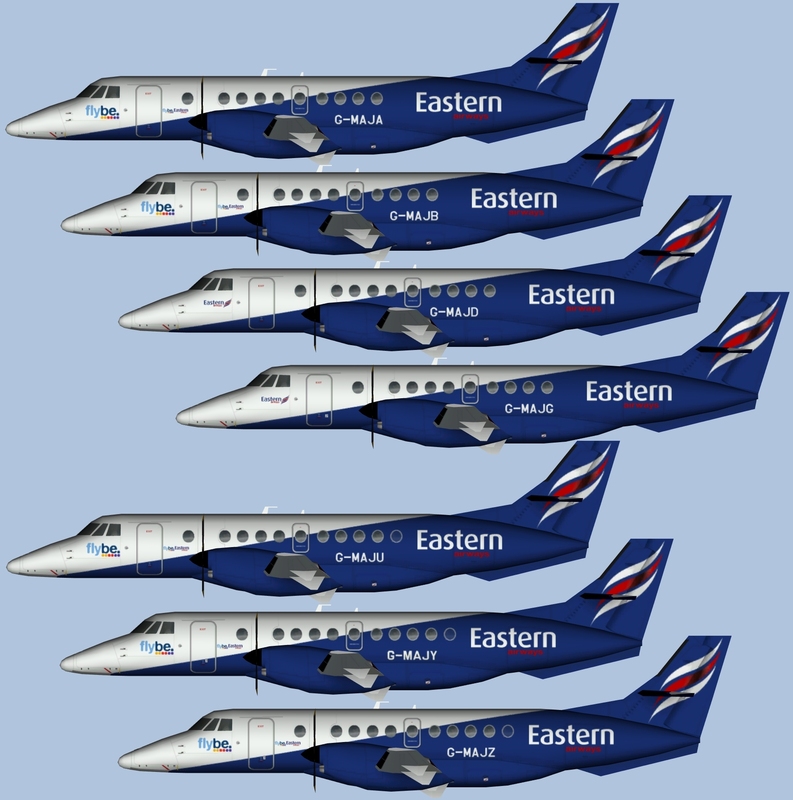 Eastern Airways Embraer ERJ-145 P3Dv4 Summer 2018 Update for the AI Malcontent Embraer ERJ-145 base model. These are P3Dv4/FSX textures only. The AI Malcontent Embraer ERJ-145 base model is required. It can be found at avsim. Search for aim_erj145.zip. To use the model in P3Dv4 you will need to convert it with ModelConverterX following the tutorials given at the Alpha India Group Forums. I’ve included lightmaps for FSX/FS9 and tga files to convert to whatever format you wish. SATENA Embraer ERJ-145 FSX/P3D for the AI Malcontent Embraer ERJ-145 base model. These are FS9 textures only. The AI Malcontent Embraer ERJ-145 base model is required. It can be found at avsim. Search for aim_erj145.zip. SkyValue Airways Embraer ERJ-145 FS9 for the AI Malcontent Embraer ERJ-145 base model. SkyValue Airways Embraer ERJ-145 FSX/P3D for the AI Malcontent Embraer ERJ-145 base model. TAR Aerolíneas Embraer ERJ-145 FS9 for the AI Malcontent Embraer ERJ-145 base model. TAR Aerolíneas Embraer ERJ-145 FSX/P3D for the AI Malcontent Embraer ERJ-145 base model. Virgin Australia Cargo BAe 146-200 VH-SFW for the FMAI British Aerospace 146-200 base model. These are textures only for FS9 and P3D v4. 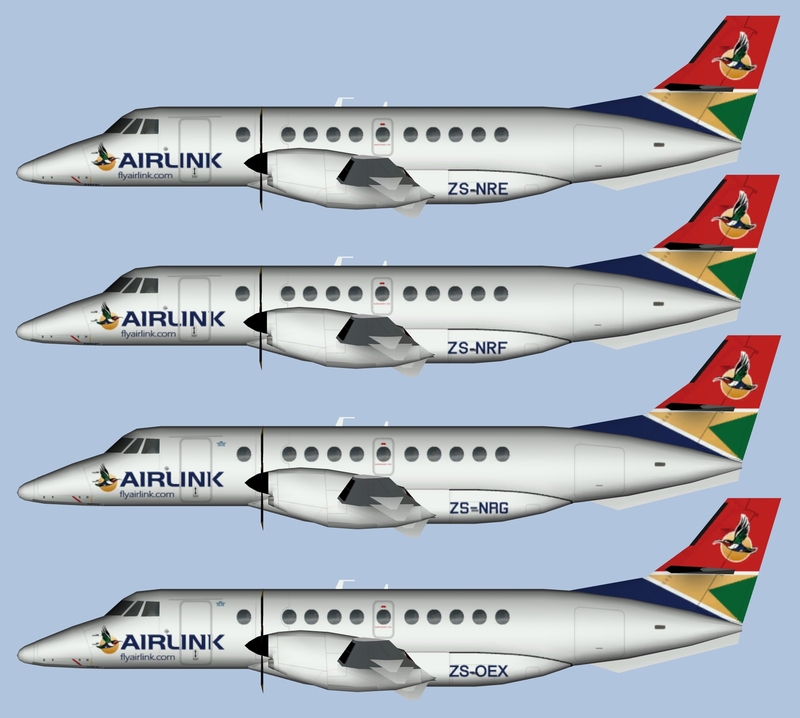 The FMAI British Aerospace 146-200 base model is required. The FMAI BAe 146-200 can be found at flightsim.com. Search for ai_b462.zip. 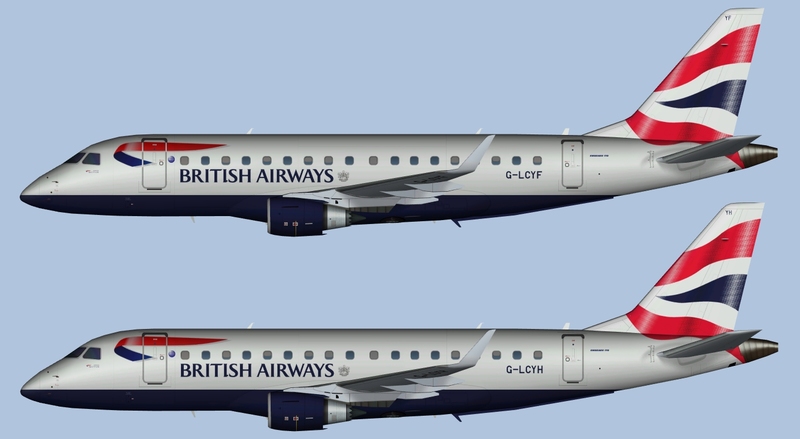 BA Cityflyer Embraer 170 Representative Fleet for the Raven Labs Embraer 170 base model. These are textures only for FSX and P3D v4. The Raven Labs Embraer 170 base model is required. 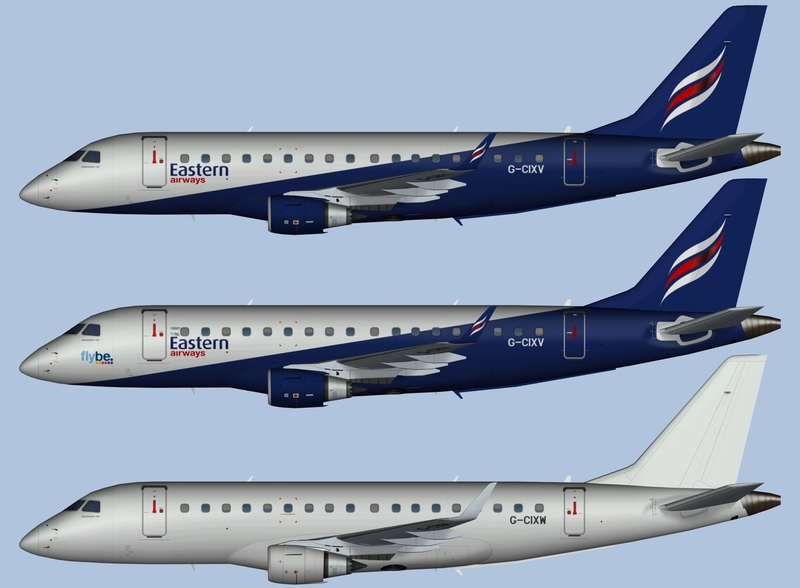 Eastern Airways Embraer 170 Fleet for the Raven Labs Embraer 170 base model.